Today, of course, is a somber day. The 15th anniversary of 9/11. We’ve been talking about it in my house. About the heroes. The firefighters. The police officers. The every day folks who helped others – some surviving, some not. I’m sure we’ll talk more about it today. We’ll have a moment of silence. Remember those who gave, or were willing to give, all – not just the 343 FDNY or the 60 NYPD/Port Authority or 8 EMS workers – but the friends who wouldn’t leave the side of someone who couldn’t make it out alone; the passengers and crew of Flight 93 who said “not on our watch”; the F-16 pilots who flew, unarmed, toward a threat they believed needed intercepted; those running toward danger while everyone else ran away; and all the others. 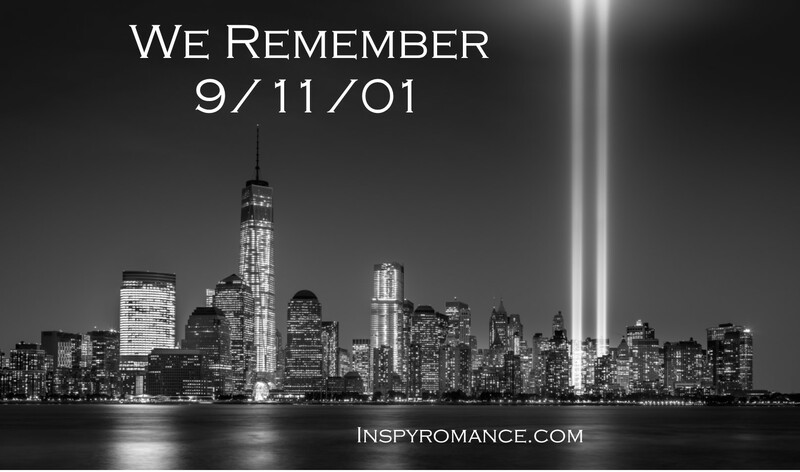 Last week, I asked what you remembered about 9/11. Today, what will you or your family do to commemorate? Beyond that already mentioned, we’re going to live life. And sometimes, I think that’s the best thing we can do. Winners are posted at the bottom of this post. Winner from Jessica Keller’s last post is Melissa! Winner from Carol Moncado’s last post is Beth Ellen! Thoughts and prayers with you all today- it is important to remember and be thankful. I totally agree with you- best thing to do is live life- preferably one of respect and thanks for the gift of life and that the sacrifice of others can remind us of the ultimate sacrifice- Jesus. Congrats to all of our winners. Congrats to all the winners. Happy reading. Thoughts to all who have suffered through tragedy and to our first responders. Jesus commanded us to “Love our neighbor as ourselves,” therefore to commemorate this tragic day in American history I believe I will show Christ’s love to the world with random acts of kindness – a smile, a hug, and an encouraging word. Blessings this Sunday! Just like we should remember all unjust deaths worldwide. A day of Rememberance is a good time to reflect & pray for all persecuted people. It’s too easy to focus on just our nation. As Christians, remember we’re fighters in the Spiritual Battles of this world. We watched the documentary 15 Septembers with our kids and talked about what we were doing that day. Congratulations winners!